In the fall of 1966 we set out to create an up-to-date film on the historic and present day problems of Jews in the USSR, a film that could be used as a springboard for public discussion, an educational aid in schools, or a television feature. Our project was completed the summer of 1968. The professional production team — all but one being volunteers — consisted of Mort Epstein, artistic director; Art Laufman (head of the Motion Picture Section, NASA Lewis Research Center), camera and sound; Ernie Walker, (NASA LeRC), camera. To complete the roster, I (a non-pro) took on the job of producer. 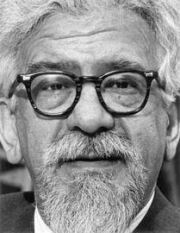 I was able to enlist the help of Rabbi Abraham Joshua Heschel to provide comments on Soviet Jewry. Rabbi Heschel, one of the most significant thinkers of our time and a civil rights activist, was then Professor of Ethics at the Jewish Theological Seminary in New York. We filmed Heschel’s section of the movie on location at JTS. 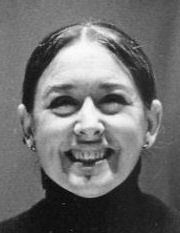 Finally, Dorothy Silver, a distinguished Cleveland actor, lent her voice for the voice-over sections of the film. The JCFC provided a grant of funds to cover the cost of film, processing and travel. We titled the 13½-minute, 16mm, color, sound film, Before Our Eyes, after Rabbi Heschel’s remark in the movie, ”Before our eyes a people and a culture are being made to vanish.” The CCSA rented, or sold outright, copies of the movie. By far organizations or individuals chose to rent. Between 1968 and 1978, there were about 450 rentals. Several copies were sold: a half dozen to the South African Jewish community and a couple each to Jewish organizations in Canada and England. Setting up for a take: left to right - Lou Rosenblum, Art Laufman, Ernie Walker. 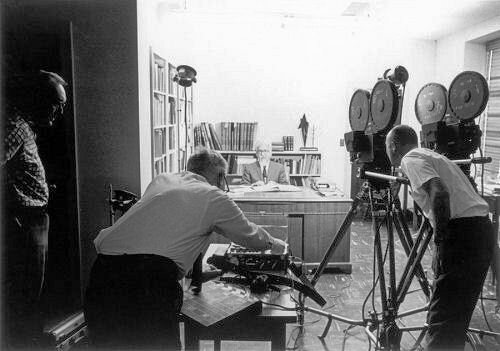 Filming in the USSR, in the 60s, was not an option. So, casting was done close to home and the filming was in Cleveland and New York. This photo, the theme shot for Before Our Eyes, was taken in the home of Charles and Elizabeth Hoffman in Rocky River, a suburb west of Cleveland. We brought in props like the samovar and the Chagall portrait of a rabbi. 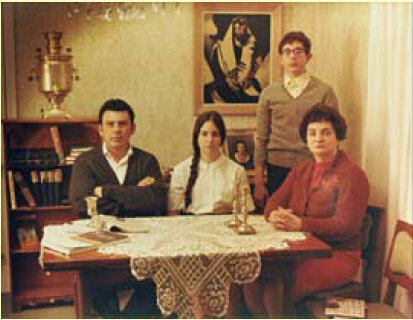 Four members of Cleveland’s Beth Israel-The West Temple were enlisted to model “a Soviet Jewish family.” They are, from left to right: Ed Ault who owned an electrical fixture business in Parma Heights, my daughter, Miriam who was then in high school, Bob Hoffman, also in high school, and Alice Mark, a social worker who lved in Berea. The photographer was a pro, John Szilagyi, Mort Epstein's business partner. John did the photo shooting and production pro bono. How authentic was the photo? At least one Cleveland Jewish organization thought it was the real McCoy. In the late 1990's the Jewish Family Service Association ran a large ad in the Cleveland Jewish News that featured it as a typical Russian immigrant family aided by their organization. Play part of "BEFORE OUR EYES"
Two clips from the movie, a total of about six minutes of playing time, are available for online watching. Caution: if you are using a dial-up connection, the viewing experience may not be satisfactory. To view the movie clips, click here. There will be a short delay before the movie appears on your screen. The 2.9 Mb .mov file is not stored on your computer. If you do not have an application that will play QuickTime® movies, you can download the free version or the optional "Pro" version from Apple's website. Click here.